I discovered Seagate Central while looking for a seamless Macintosh and Windows home backup solution. 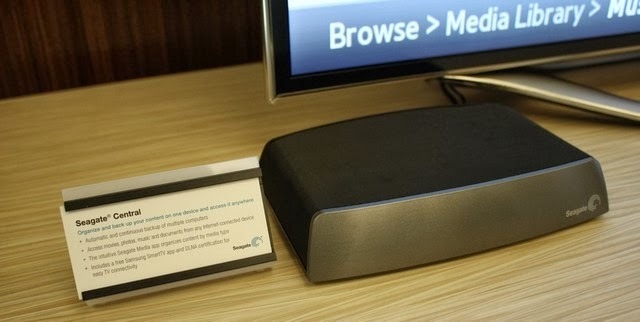 Once I started reading more about Seagate Central, what I realized was this little network attached box has a number of nice features for the network connected home. My home has a mix of Mac OS X and Windows desktops and laptops, and Seagate Central makes backing both types of PCs super simple. Macs can see Seagate Central as a Time Machine server and will work with all recent releases of Mac OS X right out of the box, making Mac backups remarkably easy. Windows users will need to install the Seagate Dashboard software before backing up files to Central’s hard disk. Another useful feature of Seagate Central is that it can backup the pictures and videos that you post to Facebook. This is an incredibly useful feature as many people don’t backup their smartphones using only social media services as a means for preserving the special moments in our lives that are captured in photos and short videos. I’m thinking about my wife and her iPhone 4 as a perfect use case here. For as useful and easy as it is to backup your Mac or PC to Seagate Central, I do need to offer a word of caution here. The Seagate Central is a single drive device. This means, that is the drive in your Seagate Central becomes damaged or fails there is no backup of the backup. The old be prepared saying goes "one is none", so if you use Seagate Central as a backup server, I would strongly recommend a second supplemental backup, such as Backblaze. Seagate Central is also a streaming media server that works with hardware that you probably already have in your home. To achieve this interoperability, Seagate has baked in Digital Living Network Alliance, or DLNA, services. This means that the DLNA can talk to your devices like a Sony PS3, Blu-ray players, Samsung TVs and many more devices. 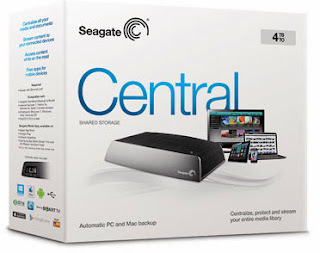 To use Seagate Central as a media server for your connected devices, just connect everything to the same wired or wireless network (802.11n or later is recommended) and grab some hot, buttery popcorn and enjoy. What about the Apple TV? Unfortunately, the Apple TV does not appear to be a DLNA compatible device. (And why should it be from Apple’s perspective? They want you to purchase and stream your content from iTunes.) Fear not, Apple TV owners! Seagate has you covered with their Seagate Media app, which is AirPlay friendly and allows you to redirect content streamed to your iOS over to Apple TV. The Seagate Media app also works with Android devices. A unique feature of the Seagate Central server is that you can use it remotely from your Android or iOS device with the free app from Seagate. Once the Central server is configured and you have installed the app, then you can access your photos, videos, or documents. Your mobile device will need to be connected to a Wi-Fi hotspot or 3G cellular service. You can also access the content stored on the Seagate Central server from your Mac or PC using a web browser and even share the content with a private email invitation. These features are allow you get much more utility our of the Central and effectively gives you your own sharable cloud-based storage solution. Seagate Central is available now and comes in a 2TB ($149.99), 3TB ($179.99) and 4TB ($219.99) models to meet your media and backup needs and budget. Just as a price comparison, the Apple Time Capsule starts at $299.00 and does not have the streaming media features. While your individual needs will differ from mine, the 3TB $179.99 version seams to be the best choice for all but the price conscious or those with lots of content to store. The Seagate Central NAS server packs a lot of value in an inexpensive package. It makes backups simple, streams media to your DLNA-compatible devices, gives you access to your data when you are on the go, provides document sharing, and works with Mac OS X, Windows, Android and iOS devices. The one thing that I would have liked to see was a multi-drive configuration for data redundancy since Seagate Central is billed as a backup solution. 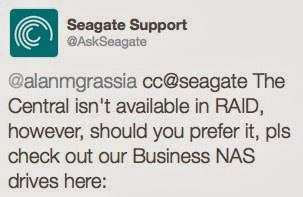 After posting a question about RAID support in Seagate Central, Seagate Support confirmed that Central does not support a multi-disk RAID configuration. In place of the Central, Seagate recommends their Business Storage 2-Bay NAS for people who want the peace of mind of a redundant data storage device. For more information and purchasing options, visit the Seagate website.